CAPIS Global Markets 3/26/2019 | International Summary | Capital Institutional Services, Inc. Most yields are rising today. 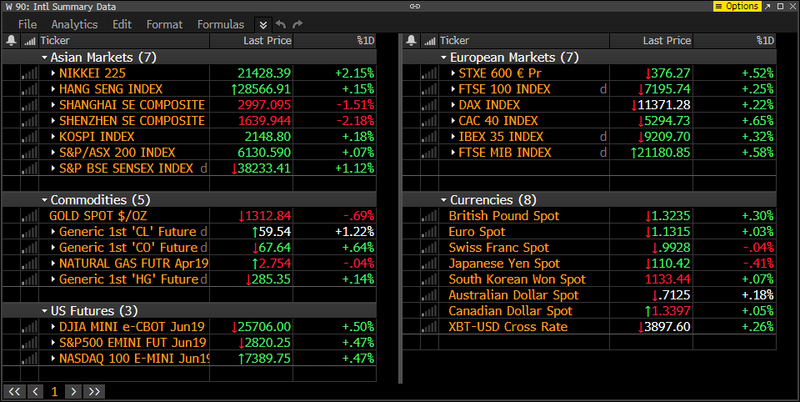 Japan’s benchmark yield higher c. 2 basis points and Australia’s 4.5. New Zealand continues to see yield declines with a widening deficit not helping. The German Bund yield remains negative. The US 10 yr. yield advances c. 5 basis points. Most of the region saw a rebound with Japan leading the way. This was despite a key profit warning in the tech sector which we will address below. The Chinese markets gave ground on growth concerns. Specifically, a Bloomberg survey shows analysts are cutting their respective Chinese GDP estimates. The survey results show consensus for Q1 Chinese GDP is now 6.2% from the prior result of 6.3%. Led by Japanese names, most sectors end the day higher. Consumer staples gained more than 1%. Chinese names helped with local investors rotating into more defensive plays. IT was flat, as was energy. Samsung Elec. -0.5% created the underperformance in the IT sector. The company sees Q1 earnings below expectations. They cite low chip prices along with weak display demand. The shares recouped about 2/3 of the day’s initial losses. Wesfarmers -3.5% is making a bid for rare-earth miner Lynas Corp +35.0% for A$1.5b. The all cash price of A$2.25 per share is c. 45.0% premium to yesterday’s close. Heavy headwinds sent Asiana Airlines -15.0% lower spending most of the day limit down. An auditors review for FY18 results in additional provisions creating a larger net loss. This is creating debt covenant and rating concerns. After a lackluster start, the region is seeing nice advance. The markets are near the highs of the day. The vast majority of sectors are green. Financials improve by 1% with personal goods, food/bevies, energy, healthcare and retail among trading at least 0.5% higher. Autos and construction have lagged all session. Following yesterday’s word of substantial order form Chinese Aviation Supplies, Airbus +2.5% trades well. U.K. building supplier, Ferguson -10.0% warns profits will be at the low end of forecasts. The company also projects revenues will slow during the second half of the year. The market was looking for greater than 5%. Ocado +4.2% will provide its automated-warehouse technology to Australia’s Cole Group. Apple unveiled its streaming service and most commentary has been look warm. There was little guidance provided regarding cost. There will be plenty of discussion regarding the impact for Netflix and peers. After yesterday’s close, Red Hat posted revenues below expectations but EPS beat. Uber is purchasing Dubai based ride sharing company Careem for $3.1b.